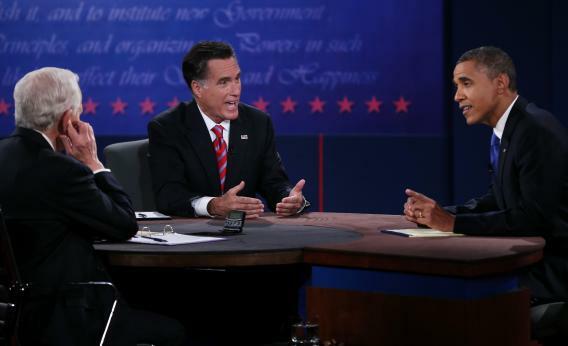 Third presidential debate: Mitt Romney avoided a real foreign policy argument with Barack Obama in Boca Raton. He knew he was in over his head. So he decided not to play. Photo by Marc Serota/Getty Images. Mitt Romney had a clear three-point plan for Monday night’s foreign-policy debate. Third, veer the discussion to domestic policy, especially the persistently high unemployment rate, at every opportunity. In sum, Gov. Romney seemed in over his head, as he has every time he’s spoken out on foreign policy (hence his determination to speak on other things as much as possible), and, perhaps knowing he would be, he adjusted his debate strategy accordingly. And yet, while President Obama came off as thoughtful and decisive by comparison, and made frequent note of Romney’s flip-flopping (“you’re all over the map” was a favorite phrase of the night), he, too, engaged in long spells of evasion. The clearest takeaway from the night—nothing new, but still sad—is that it’s probably impossible for American politicians to have an honest discussion about foreign policy, especially in an election year. The moderator, Bob Schieffer, asked good probing questions of Obama and Romney: What would you do about Syria? How do we influence Pakistan? How do you pressure China on things like currency manipulation without sparking a trade war? What deal would you accept with Iran in negotiations on its nuclear program? If you regard an attack on Israel as an attack on the United States, wouldn’t that policy deter even a nuclear Iran from aggression, as it deterred the Soviet Union for several decades? Both candidates bunted all these pitches, or simply refused to swing. Obama at least had a record to defend on assembling an international coalition to impose truly crippling sanctions on Iran. But he also said the only acceptable deal would be one where the Iranian leaders agreed to “end their nuclear program.” Presumably this means ending all uranium enrichment. This just isn’t going to happen, and Obama surely knows it. First, even Iran’s few reform politicians support a nuclear program (though not for nuclear weapons). Second, the Nuclear Non-Proliferation Treaty—which all the sanctions and U.N. resolutions are said to enforce—allows countries to enrich uranium up to a certain point. If a deal is possible, most experts agree, Iran would have to retain the right to enrich up to 5 or 15 percent. (Weapons-grade uranium is enriched to about 80 percent purity, and once a lab gets to 20 percent, the step to weapons-grade is a short one.) All successful negotiations allow the other side a way out—unless what you really want is regime change. Obama’s deal doesn’t allow a way out. Does he want regime change? The president also played it loose on Afghanistan, saying that the Afghan security forces will be able to contain the Taliban when we leave in 2014. Maybe they will, but it’s far from certain. Obama got a break, though, when Romney agreed with him. Remarkably, Romney unconditionally agreed with the 2014 timetable (after saying, a few weeks ago, that he would withdraw then only if commanders said it was safe), said everything was on schedule, and even praised Obama’s troop surge. At least this should prove (hawks everywhere, take note) that there is no mainstream political support for continuing the Afghan war any longer. Romney was most annoying for repeating, over and over, the shibboleths that he must know are false: that Obama began his term with a worldwide “apology tour” (he invoked the phrase twice Monday night), that Obama supports a $1 trillion military budget cut that his own defense secretary says would be “devastating” (such a cut would be the result of congressional sequestration), that Obama sat silent while the Iranian protesters begged for U.S. support (in fact, most of them didn’t want overt support, fearing the mullahs would accuse them of being CIA spies, as indeed they had when Bush’s secretary of state, Condoleezza Rice, offered them $75 million in aid), and that the U.S. Navy has fewer ships than anytime since 1917. At least Obama had a nice retort ready for that one. “We also have fewer horses and bayonets,” he said, adding that the governor “hasn’t spent enough time looking at how our military works” and that, for instance, we now have things like aircraft carriers, nuclear-powered submarines, and other weapons that could blast the navy of a century ago—or (he could have gone on to say) any other country’s navy today—to smithereens. But Obama’s more telling rebuttal came toward the end of the debate, in response to Romney’s complaint that China was walking all over us with its unfair trade practices. Obama responded that his administration has successfully sued China for violating trade rules many times and that, as a result, a major U.S. tire plant no longer has to compete with cheap tires dumped on the market and a steel plant in (ahem) Ohio is now shipping its goods to China. It was one of several reminders, over the course of the evening, that foreign policy isn’t really an issue in this election, however much it should be. It is, after all, one of the very few realms where young men and women are sent to kill and die, national survival is potentially at stake, and presidents have the power to do pretty much whatever they want. Read more of Slate’s election coverage.